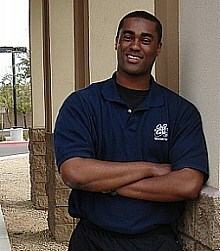 Jul 12, 2006 - Trevis Bonnett has just joined the WCM staff, emphasizing marketing with the ministry. That is, his emphasis will be to market the work to gather more workers to join us full time, to incite more invitations for WCM to come to churches to help them grow, to learn of more areas where our materials can be dispersed to win souls. Trevis was born in Brooklyn, New York. He was raised in Barbados in a Methodist Church (high church), then became Nazarene (low-church) at 19. He wrestled with obeying the Gospel for 9 months until he finally understood and obeyed in the summer of 2000. He came out the water on fire for the Gospel, and has been with WCM as a Cadre, focused and bold with it. * Every Saturday for 3 years straight, then every other Saturday I would drive one hour to the flea market to win souls and train soul winners. * I evangelized on many college campuses in NYC. I handed out flyers on obeying the Gospel on some of the highest traffic streets in New York. *I door-knocked many, many places. *The Lord blessed me to be influential in converting my mortgage banking office to Christ. * I was involved in almost every evangelistic effort in the Lord's church wherever I was located. *2000-2005- Trevis successfully marketed his customer service evaluation and sales business. He consistently evaluated at least 30 national chain stores in NYC on a monthly basis. He marketed so well that at times he had to turn down projects. * 2000-2002 – He surpassed quotas in software sales in various hi-tech retail outlets. 2003-2005 – He was the Marketing Manager for his mortgage banking company, generating thousands of dollars for the company.2005 – He developed and designed the web site, http://www.mbcrealtyny.com and was successful at marketing as an NYC realtor. As for marketing training, he studied directly mail copy-writing, marketing, market penetration, studied many articles on sales and persuasion, and studied and dabbled in website design.